The Colorado River alone supplies drinking water to 40 million Americans, irrigates 5.5 million acres of farmland, and injects more than $1 billion annually in the region’s recreation and tourism economy. An outdated system is promising more water than it can supply to a growing number of uses. 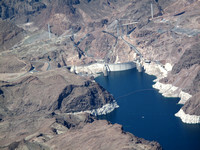 According to the Bureau of Reclamation’s Colorado River Basin Water Supply and Demand Study (December 2012), there is not enough water in the Colorado River to meet the basin’s current water demands, let alone support future demand increases. The study indicates that if present trends continue, we will see a 3.2 million acre feet deficit by 2060. Flows into Lake Powell for 2018 are expected to be just 42 percent of the reservoir's long-term average. 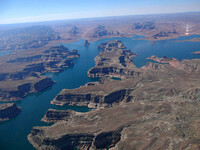 The Colorado River is the major water artery in the Southwest, a region that is drier than the deserts of North Africa. In spite of the lack of rainfall and very high summer temperatures, this dry desert is now home to tens of millions of people and includes some of the major agricultural areas in the United States. By exploiting the Colorado River, which gets most of its water from snowmelt in the Rocky Mountains, Americans have made the desert bloom with cotton, alfalfa, fruits, vegetables, specialty food plants, houses, and artificial recreation areas. An inhospitable desert has become a playground, and the Colorado River has become a plumbing system. The creation of this plumbing system has wreaked havoc on the river and its riparian environment throughout the Colorado River Basin. 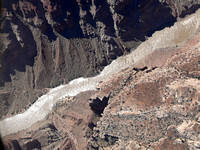 The construction of more than a dozen dams during the last century has critically damaged the integrity of the Colorado River. Hundreds of miles of canyon and countless archaeological sites have been flooded, and dozens of wildlife species have been endangered. Hoover Dam, once known as Boulder Dam, is a concrete arch-gravity dam in the Black Canyon of the Colorado River, on the border between Arizona and Nevada. It was constructed between 1931 and 1936 during the Great Depression. Lake Powell on the border of Utah and Arizona was created when the controversial Glen Canyon Dam was built and flooded Glen Canyon in 1963. In seven decades we have learned that if you take away Hoover, you also take away millions of tons of salt that the Colorado once carried to the sea but which have instead been strewn across the irrigated landscape, slowly poisoning the soil. Take away the Colorado River dams, and you return the silt gathering behind them to a free-flowing river, allowing it again to enrich the downstream wetlands and the once fantastically abundant, now often caked, arid, and refuse-fouled Delta. 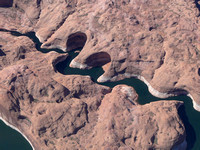 Some groups are working on an ambitious proposal called the Fill Lake Mead First Project to drain Lake Powell and store the water in Lake Mead instead. Both reservoirs are currently operating well below capacity. Proponents argue that the plan would save 500,000 acre feet of water per year lost to evaporation, restore Glen Canyon, and generate more power at Hoover Dam.